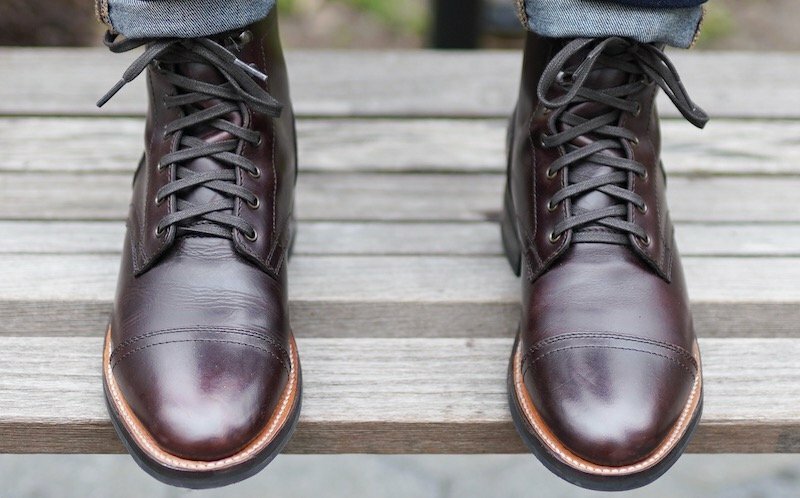 When a man decides to buy a pair of boots that can look good with any outfit, survive a downpour, and age beautifully, they’re often in for a rude awakening: high quality boots cost hundreds of dollars and there are so many aspects of a boot to take into account before pulling the trigger. I know from experience. 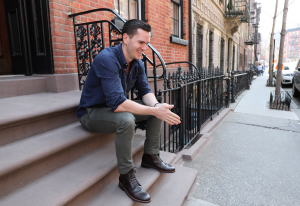 I spent most of my life living in the tropics and when I moved to Manhattan I was completely unprepared to navigate snowy sidewalks, let alone in shoes that complemented business casual outfits. I knew New Yorkers wore boots, I just had no idea what came next. Was I meant to know anything about leather? How do I know if they’re water resistant? Which ones look better as they age? Wonder no more. Here’s what to look for in a pair of boots. The stitching running along the perimeter of the Thursday Captain Boot is a sign of the Goodyear welt. If you really value water resistance but you don’t want to walk around town in galoshes, it’s a good idea to ask for boots with a Goodyear welt. This refers to the way the leather upper is attached to the sole. With sneakers, they’re glued on. With dressier shoes and boots you’ll often get a Blake stitch, which means they’re stitched on. Goodyear welts have both the upper and the sole attached to a layer of material (usually leather) that sits between them. The process leaves a telltale line of stitching running around the perimeter of the boot. Not only does this form a tight seal and make for a very water resistant shoe, it also means that it’s much easier to resole them once you wear through the sole. Variations include storm welts and split reverse welts, which are ever so slightly more water resistant, but your regular Goodyear welt should keep your socks dry and it’s seen by many as the best way to sole a boot. Chromexcel, perhaps the most popular boot leather, on the pricey Viberg and Alden boots. It’s hard to get a crash course in leather, partly because a lot of different tanneries use different terms. But put simply, you want to get leather that’s called “full grain,” which comes from the top layer of the animal’s hide. That’s the side that faces the elements, so it’s the toughest and it ages best. Many will contrast it with “corrected grain,” which is often demonized, but that just means the skin has been buffed to remove some or all of the bumpiness of the skin. Sometimes it’s overdone and results in leather that’s way too thin and plasticky (like Doc Martens boots), but many high quality full grain leathers are slightly corrected, like Chromexcel, which is probably the most popular and beloved boot leather in the US. Leathers you want to avoid are bonded leather, which is made from shreds of different leathers all stuck together, and genuine leather, which is the cheapest and least durable kind. Suede looks nice, but it’s a lot less water resistant and shouldn’t be bought if you’re after all weather boots. 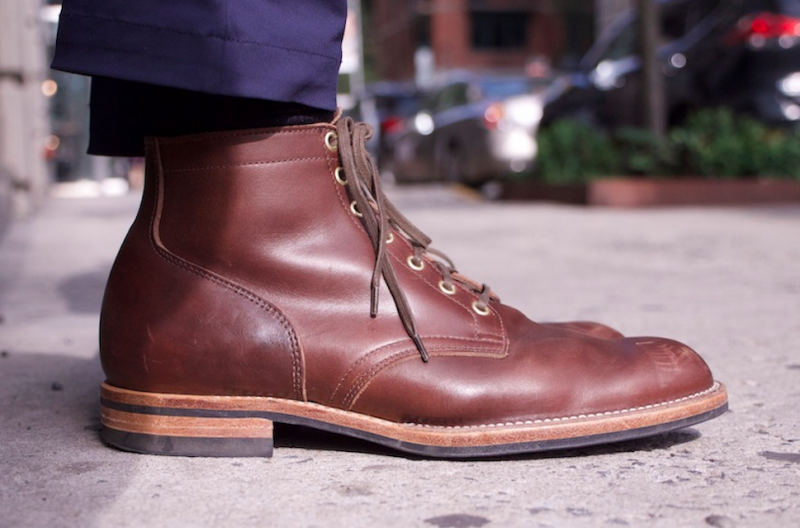 The Dainite outsole seen in the Viberg Service Boot, Oak Street Trench Boot, and others. 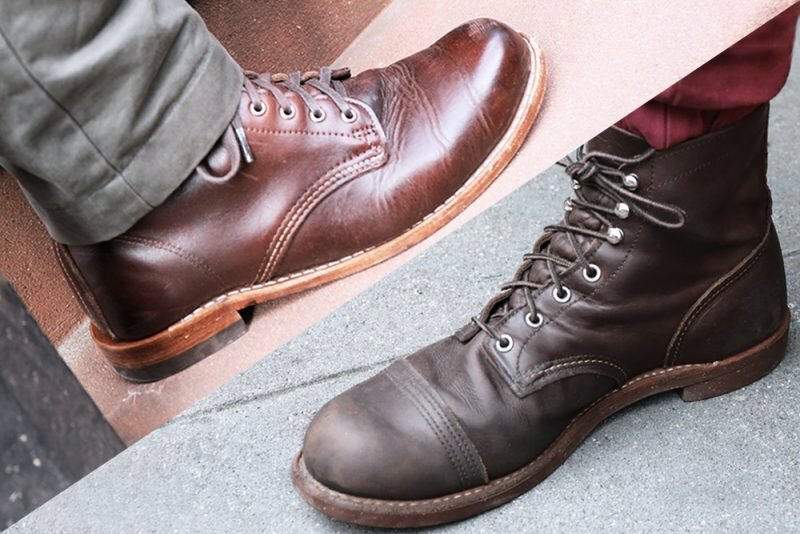 A surprisingly high number of boots that are considered outdoorsy, like the Wolverine 1000 Mile, are made with slick leather soles that offer practically no grip. Leather outsoles do have some upsides (they’re soft, flexible, and dressy) but if you’re looking for something that can handle wet surfaces while retaining a sleek silhouette from the side, you might want to look for a studded rubber outsole. Many companies default to Dainite, a popular British sole that’s usually only seen on boots over $350 a pair. But many less expensive footwear companies like Thursday and Meermin have nearly identical outsoles that function about as well. The point is that recessed rubber studs give you grip while keeping the sole looking sleek and versatile from the side. If you don’t care about formality though, you can always opt for a chunky Commando sole like the kind on the Truman Java Waxed Flesh. Want to go in the other direction and have a totally flat, old fashioned sole? They’re increasingly rare, but you might want to look for a neo-cork sole like the Alden Indy, which offers more grip than leather. This doesn’t make it onto many lists of the most important boot features, but there are plenty of folks who consider it the most important. A shank is a strip of hard material that’s put between the layers in the sole in the middle of the foot. It helps to protect the foot from punctures, it provides stability to the boot, and it helps with arch support. Shanks help to contribute to a boot’s longevity: as the boot ages it’ll start to lose its structure, but a durable shank helps to slow or prevent the boot’s disintegration. Shanks are traditionally made with steel, but some companies offer them in more airport-friendly fiberglass, leather, or even wood. This seems obvious but these days many boot companies, like Thursday Boot Company and Taft, are cutting out the middle man by selling their boots directly to consumers. This saves money, but makes some customers concerned about getting the right fit. There are a few ways to prepare: walk into a shoe store and find out your true size by using what’s called a Brannock device, the contraption that sizes your feet correctly, and make sure to get your length and width. Then find out how your preferred boot is sized; the majority of boot companies run at least a half size large, so while my true size is 11.5 I’m an 11 in most of my boots. Finally, inquire about the last. This is the foot-shaped model that the boots are made on, and every last is different. (And, often, a closely guarded secret.) Inquire with the company and search on forums like the Goodyear welt subreddit to find out how the shoe fits. Do you prefer the feeling of a boot that gently cradles the foot, holds it tight, or offers room for your toes to wiggle? Do as much research as you can, but note that this is why I prefer companies that have free exchanges in case the fit isn’t right. 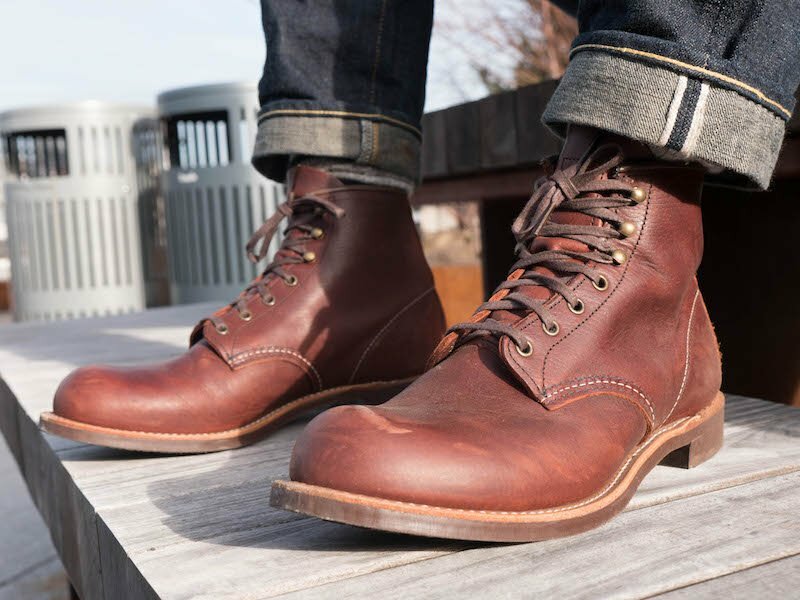 Red Wing’s Blacksmith boot, made with tough, oil tanned leather. Solid boots are more complicated than you might think, but if you’re just starting out or you want a dependable all-rounder, the rule of full grain leather, Goodyear welt, steel shank, and studded rubber outsole will help you to find a robust boot that looks good, ages well, and will survive a downpour. To find one that suits your need, check out my reviews page.